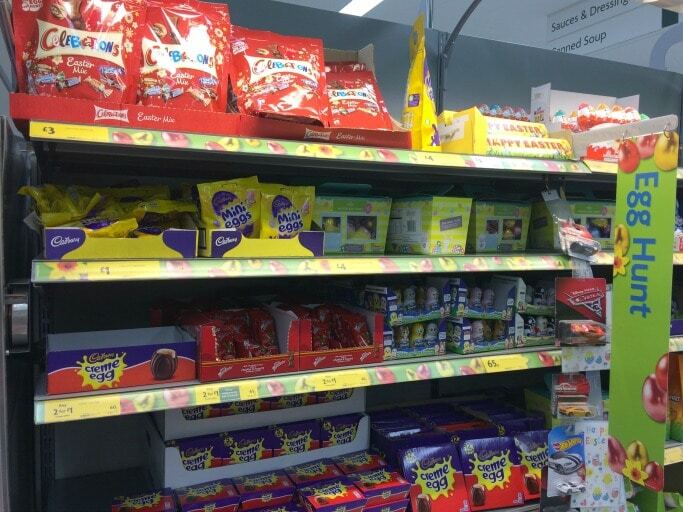 We started off by heading to Morrisons to buy all our ingredients, they’ve got quite a big selection of Easter treats in our local store and we hunted down the mini eggs in their Easter aisle. I was planning on making this with normal milk chocolate but my daughter decided we should go with white chocolate instead which I think was a great idea, it looks prettier and it stops everything being the same flavour. 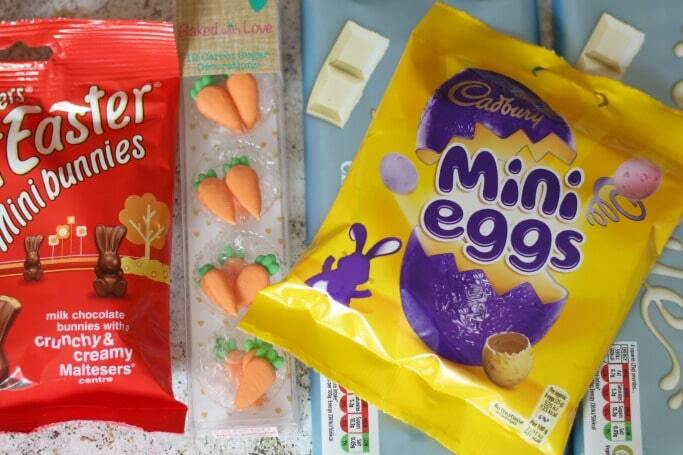 The white chocolate was from the normal confectionery section, the mini Malteser bunnies were with the Easter treats and we found the carrots in the baking section. This is a great recipe for after Easter too as if you are one of those families that ends up with a zillion Easter eggs for your kids then it’s a fun way to use some of the extras up! 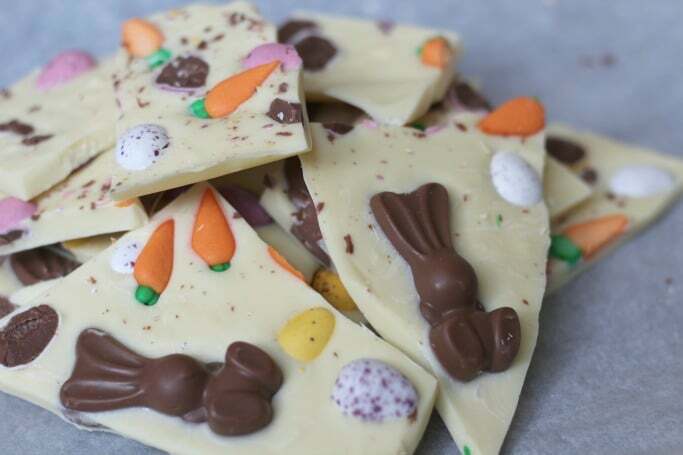 As when you make bark you are working with melted chocolate I find it’s best to get everything prepared in advance so I cut some mini eggs in half with a sharp knife while the kids got the rest of the toppings out of their packaging and ready to add to their bark. 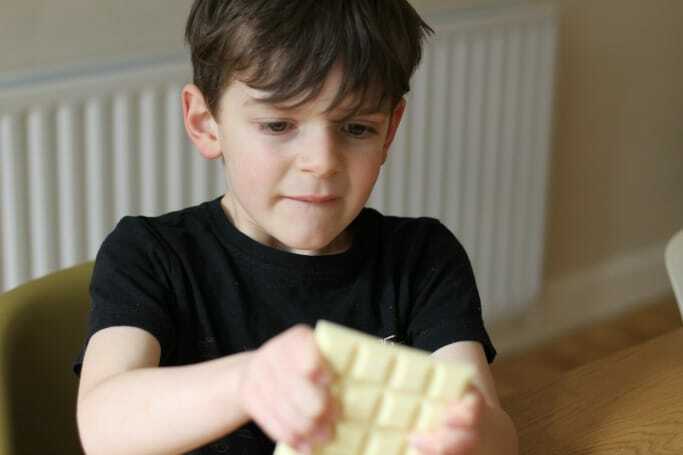 We covered a baking tray in baking paper and then the kids wet to work breaking up the white chocolate and putting it into a small saucepan ready to heat. It actually takes quite a bit of strength in your hands to break up all that chocolate but they were up to the challenge! We don’t have a microwave so instead of heating up the chocolate that way I use a bain marie made up of a small saucepan with the chocolate in it and a larger one containing hot water and this took a couple of minutes to melt the chocolate. After it was all melted all that had to be done was to pour the chocolate out on the baking paper and then the kids were ready to decorate it. Lot’s of concentration going on there! Once all the decorations on we put it into the fridge until it was set which tends to take a few hours. Of course I’d love to say that we’ve saved this for Easter Day treat but it hasn’t lasted that long at all! In good news though I can confirm that it is delicious and it would make a lovely Easter gift for someone too (if you managed not to eat it all first!) Like the sound of this recipe? Make sure you bookmark this page or pin theimage below so you don’t forget to make it. What a fun (and tasty) activity for the kids to get involved with! I can see why it all got devoured so quickly! This is such a simple and effective idea, I love it! I do this at Christmas but add candy canes. That’s such a fun activity and great way for keeping kids busy and entertained. My son also made Easter goodie at his nursery. How cute is that with the little sugar carrots in it?! My kids would LOVE this! This is such a fab idea! I love how colourful and easy to do this is. 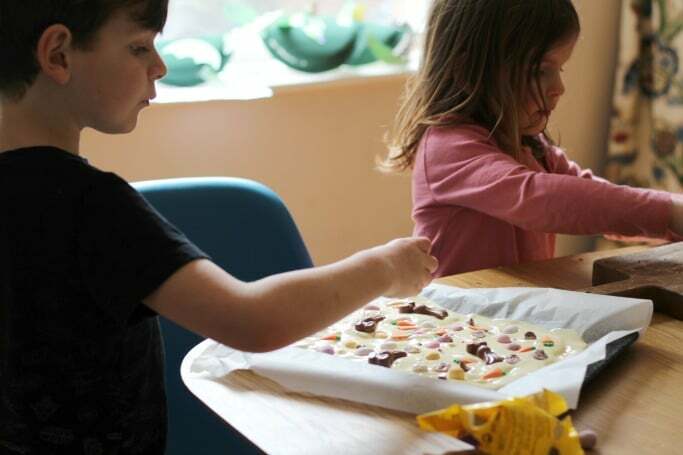 My kids for one would totally love making this chocolate bark. Oh my gosh, this looks so tasty and perfect for Easter! YUM! Personally those malteaser bunnies are my favourite! Great activity for the kids. These are so pretty too! Love the colours. Shame it had to be eaten… well, almost a shame! Ha.